There have been widespread rumors on the SCOAN building collapse details, much to the amazement of readers, especially on how the SCOAN stifled rescue operations and were uncooperative with rescue attempts. These rumors were hastily published by the Nigerian mainstream newspapers and even surprisingly the big players in the journalism domain like CNN, Aljazeera and the bbc. Recently however, very contrary and contradicting reports to the former are coming up from the coroner’s inquest into the collapse that exposes the misrepresentation of the media and other lopsided journalists. Many thanks to Nosa Osazuwa, a writer from Lagos, present during the coroner’s inquest for adequately publishing the details of the proceedings at the inquest that is bringing these liars to the limelight. True to the words of TB Joshua in which he declared that NO MATTER HOW LONG A LIE IS SUSTAINED; TRUTH WILL SOMEDAY PREVAIL. [Nosa Osazuwa reports ] Kaduna-based bomb expert, Mr Paul Iguniwei, who has also worked as a research officer with the Defense Ministry told the coroner that the building was targeted with an infrasonic weapon by the plane-like object that flew over it on four different occasions while maintaining the same flight path on the day of the unfortunate incident. “From what I observed, the four-time movement of the aircraft over the building could have been deliberate and that was to release enough dosage of the infrasonic weapon capable of bringing the building down. If you would notice, after the fourth movement, the aircraft did not return and then, the building collapsed,” he told the court. Mr. Iguniwei described the infrasonic sonar as being both invisible and inaudible but capable of causing serious damage if its intensity is pronounced. Mr paul Iguniwei said that his suspicions arose after he eliminated other possible theories due to lack of plausibility. According to him, He also said he eliminated the theory of structural defect as a result of a weak foundation because even after the collapse, there was no sign of stress on the foundation which he observed still stands intact. “Engineers generally believe that a structure would fail due to bad foundation and materials but if you go there to the collapse site now, the foundation pillars are still very intact. My position is that the building was weakened from the top”, the witness explained. Meanwhile, the Chief Security Officer of The SCOAN, Sunday Okojie, played CCTV footage to the court showing scenes contrary to the sequence of events conveyed by the first respondents such as NEMA and LASEMA. According to him, LASEMA came to the scene of the incident on Friday, September 12, 2014 around 3:10pm without any equipment while NEMA arrived around 3:24 pm. The CCTV footage revealed that both agencies came ill-equipped and didn’t spend more than 30 seconds before being ushered to the scene of the collapsed building. Additionally, throughout the rescue operation, they reported in the morning at 8am and left the scene by 5:30pm daily. When the SCOAN’s counsel, Olalekan Ojo, asked him about the allegations by both agencies that they came with several heavy equipments but were prevented from performing their statutory duties by the church, Okojie retorted, “They were lying to cover their inadequacies. Can a vehicle carry another vehicle inside because from the video before us, they only came with one vehicle that was even empty? “Also, it’s so sad that they resumed work at 8am and closed by 5:30pm like office executives. The only thing they were interested in doing was talking to the media. They were busy organising press conferences and were unconcerned with the lives they came to rescue. I can tell you categorically that it was church officials and technicians who were drilling holes and bringing the victims out of the rubble. The state counsel said they were at a disadvantage due to the evidence presented by the witness and as such did not cross examine Okojie. He therefore requested for more time to watch the footage and fix a date later for cross examination, a request Magistrate Komolafe quickly accommodated. [Nosa Osazuwa reports ] –The National Executive Coordinator of the non-governmental organization, Life Savers Foundation (LSF), Mrs Fola Shoetan, has revealed that the National Emergency Management Agency (NEMA) and the Lagos State Emergency Management Agency (LASEMA) are not adequately equipped to manage disaster situations in the country. Testifying before the court investigating the cause of the collapsed building belonging to the Synagogue Church of All Nations (SCOAN), Mrs Shoetan, who was present during the entirety of the rescue operation, expressed sadness that the statutory respondents had no idea how to handle the crisis at the site of the collapse. “LASEMA, NEMA and my agency were overwhelmed such that it was the youths at The SCOAN who told us what to do and where to drill which helped rescue a large number of people alive,” she told the court presided over by Magistrate Oyetade Komolafe. “Even NEMA and LASEMA didn’t come with any heavy duty equipment; they were merely onlookers and spectators. According to Shoetan, “I don’t know when NEMA officials left the scene on the first day but LASEMA officials left at 10:30pm on the second day. 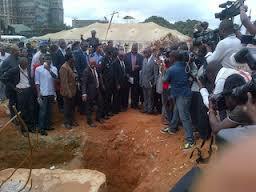 As at the time LASEMA officials left on the second day, persons were still trapped on the collapsed site. “The LASEMA General Manager, Dr Femi Osanyintola did not co-operate well with other responders and I kept telling him that. What he did most of the time was to hold meetings with his team from the state. “The police I can confirm were present throughout the period of the rescue operation. No security agent ever stopped us from working and, to the best of my knowledge, nobody was assaulted.” Her testimony contradicted earlier claims from NEMA and LASEMA officials that they were prevented from gaining access to the site and treated aggressively by church staff. Earlier, a witness who is one of the surviving volunteer workers of the church involved in the unfortunate incident, Afusat Oladipo, had told the coroner that moments prior to the collapse of the building, she had noticed a strange flash of light accompanied by a thunderous bang. Her account corroborates those of other witnesses who had previously spoken during the inquest. Their accounts all suggest the possibility of an explosion. Meanwhile, Chief Magistrate Oyetade Komolafe has adjourned proceedings to January 6, 2015. Nosa Osazuwa ( Email: nosa.osaz@gmail.com ) reports from Lagos. This entry was posted in NEWS, SCOAN BUILDING COLLAPSE and tagged building collapse Inquest, SCOAN International, Tb Joshua. Bookmark the permalink. watch tbj thank you for yet another eye opener…………we all pray that at the end of this case the truth would finally prevail and all anti-tbj folks would be put to shame. This post has just shown how untrustworthy and unfaithful the Government of Nigeria can be. 1. We have been praying all along for the truth to come to light. I know that SCOAN is a God sent mission for this generation through Prophet T B Joshua at this time. 2. Nigeria media and many other institutions are working only on the material things and lack deep in-depth analysis on things in the spirit. 3. Painstakingly the Church is still the one to rescue the people and the court, provide equipment and pay the bills, preach and protect victims. 4. The Church should remain a model in honesty and evidence provision, justice and judgement, in hardship or in prosperity. This bad case has a great opportunity to expand the gospel of Jesus Christ. This should be the focuse; that Christ Jesus shall be honoured. 5. I pray that the Church will be able to go through this case to the glory of God and edification of the Church in Jesus name.